Animal lovers will attest to the power of a four-legged friend when there are no words to ease the pain. 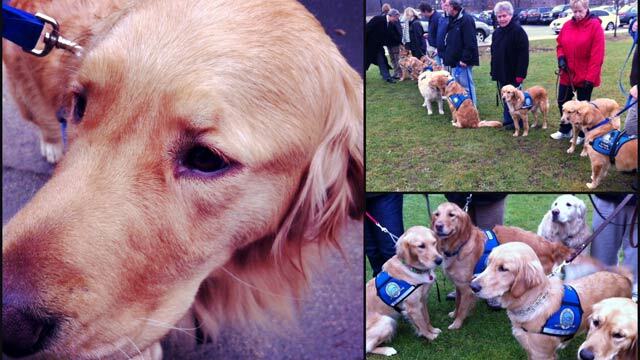 A group of golden retrievers traveled from Illinois to Newtown, Connecticut, the day after a gunman killed 27 people in the tight-knit community. The town is mourning 20 children and six adults who were victims of the mass shooting in Sandy Hook Elementary School, and the shooter’s mother who was killed in her home. The organization Lutheran Church Charities brought the dogs to give comfort to anyone there in need. Chewy, Ruthie, Abbi, Prince, Luther, Maggie, Hanna, Barney, and Shanni are the therapeutic canines offering a calm, loving presence. They give children and adults a reason to smile after disasters and crisis. Find out more about the special service they’re providing in Newtown and how they train them in Gary Tuchman’s report at 8 and 10 p.m. ET. This is a dumb idea. Some people are allergic to dog hair and/or don't like dogs and are afraid of dogs (dogs bite and kill)!! Anderson, thank you so much for your coverage tonight from Sandy Hook. You showed great compassion and love to the families and for the the victims.There are no words that can express how so many of us feel but our hearts go out to the families. The children are so beautiful and ourprayers are with them. We all need Life 101, learning to deal with frustrations and set backs in a non-violent manner. Coping techniques need to be learned by all. Then the disruptions in life can be dealt with early, not accumulating to an extreme frustration or anger and possible subsequent dangerous action. Anderson-Please check out Lutheran Church Charities and its leader before allowing your program to grab time to solicit funds for their charity-A friend went through them to acquire a therapy dog and they collected hundreds of dollars from her church and never received a dog for her handicapped daughter. This man is a fraud. Th dogs are beautiful and all golden retrievers are natural therapy dogs. We raised them and rescued them for years. He is not a trainer and has no credentials. I am glad they brought the children some happiness – now he will pounce on the publicity and make a profit from it. Janet, I personally know many of the people that work at LCC and I can tell you that I have never met such hard-working self-sacrificing people in all my life. Whenever there is a need, they are there to help. They weekly communicate needs and at the same time, share how generous people have meet those needs, too. I know nothing of your experience that you mentioned, but I can tell you that each of them would do what they could to right a wrong. Through the Comfort Dogs and the many other ways they serve, like helping in Haiti, Lutheran Church Charities continues to be a shining light in a dark and often confusing world. Has this video been posted? It won't play for me. I think it's a great idea – Golden Retrievers are the perfect dog for this! CNN- please post the web link for this organization. The video is "no longer available" and it just seems like it would be a great gift (to send a donation to them in someone's name). Thanks. I am deeply sorry about the tragic events that unfolded earlier involving these innocent kids. I do believe that people should consider the allergic reaction to animals BEFORE they assume that everyone has the same tolerance level for pets. Personally, "I hate dogs." All dogs (cats even moreso). Don;t assume that these 4 legged "sneeze" and "cough" factories are a saving grace for all. Keep them away!!! Great that dogs can be brought in~bring more and make available to all who wish to use this resource. These dogs create miracles and will make a huge difference in the quality of llfe of primary and secondary victims. What a perfect "job" for those beautiful animals - I am sure they bring momentary comfort and peace to those who need it most. And thanks to their two-legged friends who are devoted to their training. I hope they can use comfort dogs when the children go back to school. This might make things a little bit easier for them. Dogs are amazing creatures and good listeners too! Thank you for your compassion during this awful tragedy, reporting this must be an emotional roller coaster for all of you. MENTAL HEALTH: Screw the gun law debate! The real shame in all this is the embarrassing, humiliating lack of any real Mental Health Medicine in this country. Without insulting the mental health professionals that do exist – I am sure they would agree with me that – what is available in mental health facilities and benefits, especially prevention and intervention when a danger to self or others, is one millionth of what is needed. To get real long term mental health benefits in this country one has to be charged with a crime – labeled a criminal – not ill.
Add to that the attitude of Americans toward those suffering mental health issues wouldn’t be tolerated toward other illnesses: cancer, tuberculosis, heart disease, physical infirmities of any kind. Imagine hating or humiliating those suffering from any of the other illnesses above like people do toward those who are mentally ill. Adam Lanza is universally hated. Period. not one of the 28 deaths in Newtown, 15 miles from my birthplace, would have occurred. We need both easy, inexpensive access to mental heath care (and all health care, for that matter) AND more regulations to make it very difficult for guns to get into irresponsible hands, whether mentally ill or not. They're not mutually exclusive. We also need to avoid demonizing all mental illness. Relatively few such illnesses lead to outwardly violent actions. I couldn't agree more. It's not about gun control,,,it's about mental health! Those guns were not illegal. Anyone who is of sound, body and mind would not do these horric acts. There was more to his mental illness than Austism or Asperber. I believe that was a cover up. Why did he have to smash the computers? Obviously there were things on there that he didn't want anyone to see. Never judge a book by it's cover. I appreciate your coverage. I am a school counselor and there are so many gaps in how we get kids the help they need. Thanks for looking at all the angles. HELLO...aren't there SEVEN adult victims!!!! Why doesn't anyone include Nancy Lanza in the list of those killed by Adam? Isn't she a victim as well? Unimaginable tragedy... I cried all weekend for those parents and families. Since we can't stop the guns or the insane mentally ill people, we as communities should look at the way the schools are built. Build in safe rooms for students and teachers to get to. I realize the cost would be tremendous, but in light of the latest heartbreaking events, it would certainly be worth every penney if even one person is saved. Even if it's a tunnel for them to crawl through... something to help the courageous teachers keep their kids safe. I don't believe building safe rooms within schools is the answer...those that intend on taking innocent lives have found them in theatres, shopping malls and block parties...and where ever people assemble...churches, sporting events, concerts, subways.. the list is endless. The onus is on each one of us to be visual in our surroundings and of the people in our lives. Anderson, I'm amazed that nobody has mentioned the 1999 Surgeon General Report indicating that the biggest void in our health care system is Children's Mental Health. 14 years later and we still have a dysfunctional mental health system. That's really nice, I'm sure the dogs will be of great comfort. There are no words one can say.